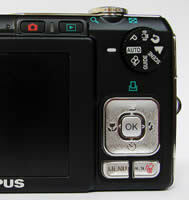 The Olympus FE-300 is the new top-of-the-range model in Olympus' entry level FE series of digital cameras. Sporting a mainly metal build and retailing for around the �200 / $300 mark, first impressions of the new slim-line FE-300 from Olympus are good. On paper at least the Olympus FE-300 seems to have it all: 12 megapixel resolution, face detection technology plus high ISO functionality (an impressively broad range from ISO 50 up to ISO 6400) alongside a standard 3x optical zoom and 2.5-inch, high resolution screen. So, the question is, have the Olympus FE-300's good looks and numerous features been delivered at the expense of operation and performance? Gavin Stoker took it all the way to Japan to find out. Despite it being obviously yet another point-and-shoot compact aimed at the 'happy snapper' brigade, the brushed metal faceplate and black finish of our Olympus FE-300 review sample lend it an air of sophistication beyond that which you'd expect given the outlay. Also, with lithium ion battery and optional xD-Picture Card inserted, the weight of the camera feels 'about right' in the palm, just a tad heavier than an average mobile phone. In short, the FE-300 feels sturdy enough to withstand the odd knock or butter-fingered fumble � which is exactly what you want. Despite its slender pocket-friendly proportions this latest Olympus is not as unobtrusive as it could be. Unlike, say, the shock and waterproofed Mju 790 SW, which features internally stacked optics, the FE-300's lens barrel extends from the body when in use. It does however share the Mju's dime-sized mode dial at the rear � which is unfortunate as it's only just large enough for viable operation. 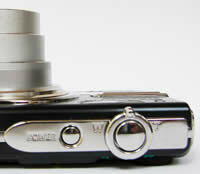 Still, the front of the camera � the business end if you like � definitely looks the part. There's a window for the flash bulb top left of the lens, next to which is an indicator lamp for the self timer, while two tiny holes for the built in microphone nestle just below the lens, which is protected by a sliding metal cover when not in use. 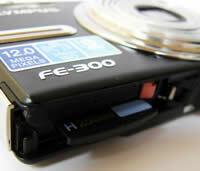 Furthering the streamlined feel, the top of the Olympus FE-300 is uncluttered. It features a large-ish shutter release button standing proud and to the right, encircled by a springy lever for operating the zoom. Next to this is a slightly recessed power button. There's no chance of confusion over what these controls do and use of the zoom control rewards with a smooth action, although it's accompanied by an audible mechanical buzz. 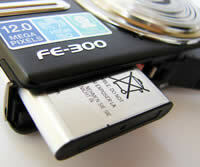 The back of the Olympus FE-300 is equally free of the potential to cause stress for novices. Ranged to the left, the standard 2.5-inch LCD monitor takes up the majority of space and is used for both shot composition and review in the absence of an optical viewfinder. The quality of the screen could best be described as reasonable, in that some noise and ghosting is displayed when using it indoors in low light, while when using it outside it's difficult to tell whether a shot is accurately in focus � the displayed image appearing generally soft, despite the claimed 230k pixel resolution. Simply put, though adequate for the job it's certainly not the best in its class. Above the LCD are two adjacent buttons, one, with the familiar red camera icon, signifying image capture mode, and the second with the green triangle indicating image playback. To the right of this, is the aforementioned dime-sized (or half-penny for our UK readers) mode wheel. Despite its Lilliputian size, there's a firmness to it that means you won't accidentally slip past your chosen setting in the heat of the action. For the record, the selectable modes are either fully auto shooting (whereby all except the very basic on-screen menu options are disabled), program, ISO-boosting anti-shake/image stabilization mode designed to reduce the effects of camera shake, portrait mode, landscape mode, scene mode (comprising 12 night portrait, sport, indoor, candle, self portrait, sunset, fireworks, behind glass, cuisine, documents, auction and 'smile shot' modes). Like similar modes on the latest Sony cameras, this latter mode releases the shutter when the camera detects smiling human faces in the fame. You also get a useful 'guide' mode (in effect a rudimentary manual built into the camera from which you effect chosen settings with a couple of button presses) and finally video capture mode (unlike early Olympus compacts, this time with sound). Below the teeny mode wheel are a larger square-plate like panel for the four way controller, with a central OK button. Though the controller is used primarily for tabbing through menu options and captured images in playback, in capture mode it allows on-the-fly selection of exposure compensation, flash settings, macro mode/s (shooting down to a so-what 30cm or a still so-so 10cm), plus self-timer options. Self-explanatory icons for each are ranged around its four sides. Underneath this you have two further buttons. On the left is the main menu button, which, when pressed, instantly calls up the cartoon-ish, icon distinguished shooting or playback folders on-screen that will be familiar to any user of Olympus compacts. You delve into icon-led folders these with a press of the 'OK' button, whereupon tabbing through menus and affecting changes is as swift and painless as you'd hope. The button on the right meanwhile is a dedicated delete button for banishing duff shots from the memory. On the right flank of the Olympus FE-300 � if still viewed from the rear � you find a metal cover for the USB and A/V out ports rather than the springy rubber/plastic cover found on other models in this price range, which adds to the FE-300's solid feel. Below this is an equally glossy and metallic 'lug' for threading through the supplied wrist strap. The left hand flank of the FE-300 features a similar shiny metal brace and is devoid of any features whatsoever. Flip the camera over to inspect the base and you'll find a screw hole for a tripod, nestling next to which is a slide and flip open plastic-covered compartment. This houses both rechargeable lithium ion battery and optional xD-Picture Card. The Olympus FE-300 is quick to power up � a press of the power button and the lens barrel for the 3x zoom extends from storage flush to the body in just over a second, the rear LCD bursting into life. The camera then takes roughly three seconds to commit a 12 megapixel JPEG to memory, which may not be the fastest but, at this resolution, is certainly forgiveable. Once the camera has determined focus and exposure with a light press of the shutter button, there's no noticeable delay as you go on to take the shot. If we've a noticeable gripe to make before inspecting image quality it's a shame that � because of the pocket sized dimensions � there's not much to actually grip on the FE-300. When you make an attempt your thumb slides around between the mode dial and the edge of the screen, while your fingers struggle to get much purchase on the polished faceplate. Holding the camera with two hands to therefore try and limit camera shake simply feels uncomfortable, with not enough of a gap between the edge of the screen to the left and the extremities of the camera itself to avoid it likewise sliding around. PhotographyBLOG is a member of the DIWA organisation. Our test results for the Olympus FE-300 have been submitted to DIWA for comparison with test results for different samples of the same camera model supplied by other DIWA member sites.